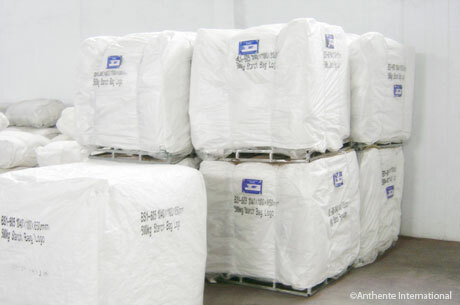 After Quality Check, the Packaging Teams will fold the bags to a predetermined configuration for maximum efficiency. Then they are mechanically pressed, covered, and labeled onto metal-alloy pallets until the bags are finally loaded into a container. The metal-alloy pallets ensure the bags will not become dirty or compromised due to splintered or broken wood pallets. The metal-alloy pallets are durable, easy to clean, and give assurance that you will not receive a damaged bag or fabric from Anthente. In addition, wood pallets may harbor insects and other pests, possibly compromising food-grade or pharmaceutical cargo. Due to strict US and Canadian customs regulations, all wood pallets must undergo fumigation and could potentially contaminate the bags with a layer of pesticide and other chemicals. Because Anthente only uses metal-alloy pallets, such an invasive step is completely avoided. We hope this step-by-step presentation was informational and gives you a glimpse of the manufacturing process at Anthente. For additional information, please contact us via the online form. To request a quote, please visit our Quote Request Form.